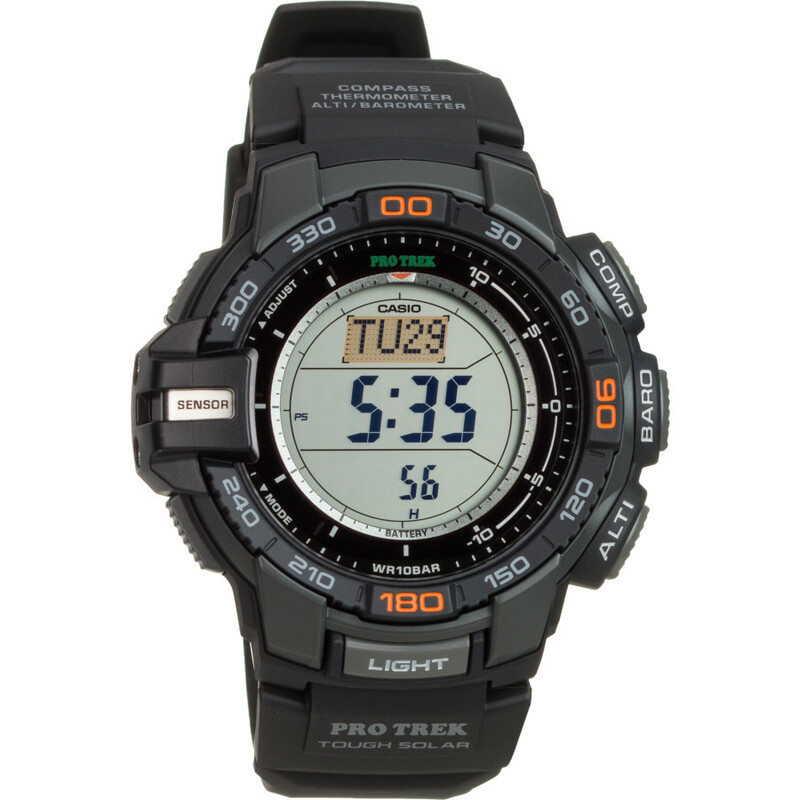 The Casio PRG-270-1 ProTrek features an analog-digital display and Version 3 Triple Sensor technology. In addition to its fast and precise sensors for taking bearing, altitude, and barometric pressure readings, it's also capable of alerting the wearer to significant changes in barometric pressure by an alarm and a unique indicator on the digital display. The Triple Sensor Version 3, an advanced Casio technology that makes it possible to pack sensor that are 95% smaller than those of previous models into a totally new type of compact PRO TREK. Despite their smaller size, the new sensors in these models deliver higher reading accuracy and improved energy efficiency. Black resin band digital with neutral face. Review: OK, I'm not a pilot even though I've got 30 hrs in my uncles J3 Cub. But, I do skydive on a regular basis, and have found this watch to be my 2nd best friend at 13,500 ft. AGL. It is a fantastic back up to my regular altimeter. The few times I've landed "off" it gave me a god compass reading back to the DZ. I feel this would be a good back up/cheap insurance to any pilot if you should loose all instrumentation. Cons: A little tough to set if you have big fingers, I use a pencil tip.